This spectacular photograph of a gorgeous bride and handsome groom was captured in front of Southern Oaks Plantation in New Orleans during the couple's wedding reception. 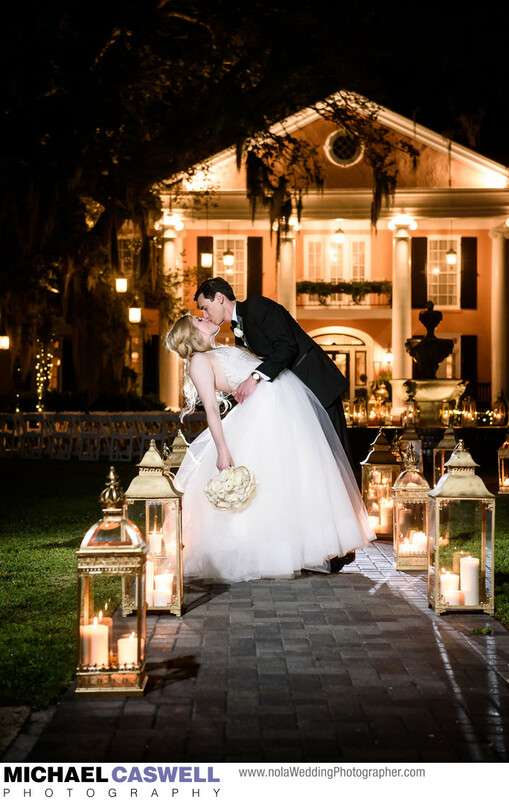 Candle lanterns lining the graceful walkway and the warmly-lit plantation in the background give a beautiful accent to this classic dip shot. One of the great things about this wedding venue is that you don't need to add anything in terms of decorations, as the exterior is beautiful already, and the interior has numerous decorative elements included standard. But, of course, if desired you can still customize the decor to fit your particular vision. It's not uncommon for there to be large floral arrangements on the front porch where the ceremony takes place (which are then subsequently moved inside to accent the area behind the cake table). But this was the first time I've had a Southern Oaks wedding with lanterns placed along the walkway, and they really looked spectacular, both during the ceremony itself, and for our portraits of the newly married couple later in the evening. These decorations, as well as the flowers, were provided by the amazing artists at Bella Blooms. I've shot many weddings at Southern Oaks over the years, so I've become very accustomed to how events are structured at this venue, and I work with venue staff to determine the best time to go outside and capture these kinds of portraits. Typically right after the ceremony, we do the formal group photographs, and then the couple is ushered into a separate room to share a private meal together (which is when the wedding photographer and videographer will eat as well). After this, what usually works best is for the couple to be announced into the reception, with their first dance and the parent dances taking place. This enables Southern Oaks staff to keep the pace of the reception moving along as scheduled. Then, we can head outside afterward for portraits. A word of advice though, don't procrastinate! The later we get into the reception, as the party atmosphere ramps up higher and higher, you'll be less and less enthusiastic about leaving even for 10 minutes. So if these particular pictures are important to you, let's do them as early as possible! In some circumstances, this timing may be shifted around a bit. For instance, if it's a late afternoon/early evening wedding and couple really wants some daylight pictures of just the two of them outside, and it would be dark if we waited until midway through the reception to do these portraits, we can instead do them earlier, such as immediately upon the conclusion of the ceremony. The main downside to this is that the wedding party and family will have to wait 15-20 minutes before we can proceed with the formal group shots, but the fact that Southern Oaks provides those waiting in the photography room with their own bar and tray passes of food makes this much more tolerable than it otherwise would!